Machine learning (ML) methods, developed mostly by computer scientists and statisticians, have brought remarkable success in solving prediction problems, especially with high-dimensional and complicated or, simply, big data. These methods have been used with great success, for example, in spam filtering and computer vision, among many other things. In economics, however, prediction problems are of limited interest, and instead, the problem of measuring causal parameters, including various treatment effects, is much more important. Therefore, there has recently been an increasing amount of work in the econometrics literature trying to apply ML methods for estimation of causal parameters. One of the findings in this literature is that naively applying ML methods for estimation of causal parameters leads to unsatisfactory results: since ML methods are heavily regularized, ML-based causal parameter estimators are substantially biased, which leads to suboptimal precision of these estimators. Moreover, because of the bias, it is hard to study distributional properties of these estimators, which makes inference based on these estimators overly complicated. 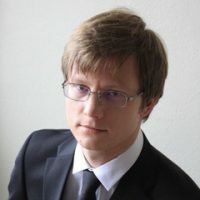 In an attempt to overcome these difficulties, Denis Chetverikov (UCLA) has developed a novel method called Double Machine Learning (DML), in a joint project with Victor Chernozhukov (MIT), Mert Demirer (MIT), Esther Duflo (MIT), Christian Hansen (Chicago Booth), Whitney Newey (MIT), and James Robins (Harvard). This method is based on the observation that it is typically possible to represent the causal parameter of interest as a function of the solution of several prediction problems such that the bias in the solution of these prediction problems has minimal effect on the causal parameter itself. As long as such a function can be constructed, the DML method uses ML algorithms to solve each prediction problem separately in the first stage and then plugs in the solutions into the function giving the causal parameter of interest in the second stage. The authors show that by combining the DML method with a certain cross-fitting procedure, one can construct approximately unbiased and efficient estimators of the causal parameters, which have as high precision as possible, under very mild regularity conditions and allowing for a wide variety of ML methods to be used in the first stage. The authors also explain how the function relating the causal parameter and the solution of the prediction problems can be constructed in most commonly used econometric models via so-called Neyman orthogonal scores, which are extensively studied the literature on semiparametric estimation. As an example illustrating the applicability of the DML method, the authors study the effect of institutions on economic growth following up on Acemoglu, Johnson, and Robinson (2001), “The colonial origins of comparative development: An empirical investigation,’’ American Economic Review. Estimating the effect of institutions on output is complicated by the clear potential for simultaneity between institutions and output: better institutions may lead to higher incomes, but higher incomes may also lead to the development of better institutions. To help overcome this simultaneity, AJR use mortality rates for early European settlers as an instrument for institution quality. The validity of this instrument hinges on the argument that (i) settlers set up better institutions in places where they are more likely to establish long-term settlements; (ii) where they are likely to settle for the long term is related to settler mortality at the time of initial colonization; and (iii) institutions are highly persistent. The exclusion restriction for the instrumental variable is then motivated by the argument that GDP, while persistent, is unlikely to be strongly influenced by mortality in the previous century, or earlier, except through institutions. AJR also note that their instrumental variable strategy will be invalidated if other factors are also highly persistent and related to the development of institutions and to the country’s GDP. A leading candidate for such a factor, as they discuss, is geography. AJR address this by assuming that the confounding effect of geography is adequately captured by a linear term in distance from the equator. However, if the true geography effect is non-linear, which can be expected, the AJR estimator may be substantially biased due to misspecification, and the DML method allows to overcome this problem by flexibly controlling for the geography effect. By applying the DML method to the AJR data, the authors confirm the AJR results that there is a substantial effect of institutions on country income, but the effect is smaller than reported by AJR. Moreover, the precision of the DML estimator is higher than that of the AJR estimator.